What can you say about Las Vegas … airport? Well it might have been an idea not to try reducing the journey to and from the airport by just attempting to make the airport reach to the city! It was HUGE! I thought I’d got to one of the casinos when I was only in baggage reclaim! Minor heart failure followed as I thought my bag hadn’t made it, okay I was at the wrong carousel initially, but even when I got to the right one it took forever and arrived after 1 dozen hockey sticks and uniforms. Now I’m guessing based on my limited knowledge of US sports, that these were for Ice Hockey. So only I could get stuck behind an Ice hockey team in a place that regularly has temperatures in excess of 110 degrees. I catch a taxi after what appears to be a see-how-many-times-we can-make-hundreds-of –people-walk-up-and-down-passing-each-other-before-letting-them-reach-the-sidewalk competition, and within minutes I’m on the strip and arriving at my hotel. 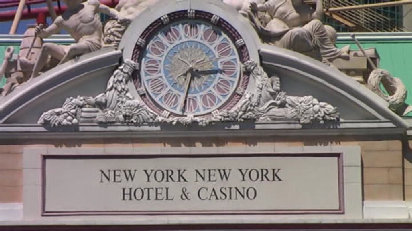 There are a few similarities with most of the Casino’s on the Strip, they have (hardly) any natural light, that way you can’t tell how long you’ve been gambling. Most have theatres, bars, various restaurants, as well as the gaming tables and what are called Sports bars (where most of the live sport of the day, from [it appears] anywhere in the world are shown on large screens and you can bet on the outcome. These quite often have large multi-coloured screens of rows of odds that would put some stock exchanges to shame. 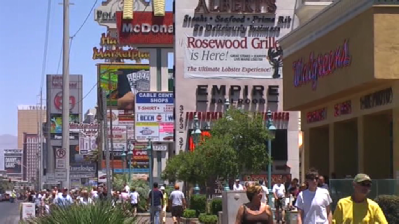 The Excalibur as you would imagine has a medieval theme, with ye olde worldy typeface on the signs. 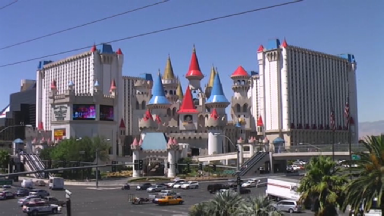 Shows like the Tournament of Kings with knights on horseback jousting and restaurants called the Steak House at Camelot, the Round Table buffet and the Sherwood Forest cafe. Some find it tacky, I really enjoyed my time there and would have no problem going back. My room was spacious and had everything you could need, TV with movies, en-suite bathroom, iron, a safe for your valuables and air conditioning. I found that it was cleaned daily to a very high standard and I had no problems with the room (except the card reader on the door took a couple of attempts to read the card on a few occasions), noise or any other problems with neighbours was non-existent there, unlike some other hotels I’ve stayed in. I didn’t see any of the shows in the Excalibur as the ones I wanted to see were in other hotels. I did drink in the bar there… no come to think of it I didn’t, but this wasn’t through a conscious choice more that when I wanted a drink I was somewhere else. I did have meals at the Sherwood forest café, the MacDonald’s in the food court, and a couple of hot dogs in the takeaway restaurant near the entrance to tower 2 (the for-mentioned warm canines were huge and very nice). It was gone 7pm local time when I arrived so my plans to fit in a show that evening went by the board, so I got to the queue for check in only to hear a German father in front of me on the phone to his travel agent ” I can’t stay here it’s too noisy” …TOO NOISEY! You’re in a Casino in Las Vegas for cripes sake. I get to the desk and ask if I can pay the extra to upgrade to one of the modernised rooms (as I’d read on tripadvisor) they were worth the $20, and got a pleasant surprise. “You’re already in one”, so there you go. I head to the 21st floor of Tower 2, the view isn’t great, overlooking the roof of the casino and facing the other tower, but hey you don’t come Vegas to look at the view from your hotel room. I immediately drop off my bags and venture out, across the raised walkway to New York New York Casino and stumble on one of the best places I found, The Bar at Times Square. Where they have a live duelling piano shows every night. This consists of two keyboards in piano bases on which teams of two very talented pianists play … well almost anything really. You can give a few dollars and a request and, they’ll play that as well. The atmosphere was great and the drink (by Casino standards) reasonably priced. I stay there for a while, wander around a bit and then head to the hotel and crash out for the night. 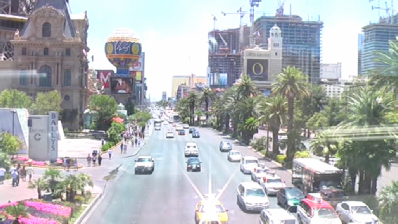 Friday in Las Vegas. Now I was advised about the heat and to drink lots of water (for water I substituted liquid … for liquid I substituted Lager!) So I partook of a liquid breakfast and headed to the MGM Grand hotel to book one of the shows I wanted to see. On my list for the trip was Rodney Carrington (American comedian, think of a country and Western Billy Connolly), Elton John (as the only “headliner” performing whilst I was there) Cher, Bette Midler and Barry Manilow all taking a break… was it something I said? And finally the Jersey Boys (Musical based on the career of Frankie Valli and the Four Seasons). The first and last being my “must sees”. I get a ticket for the first and am advised that individual box offices are the way to go for tickets for the popular shows, so I head for the Palazzo hotel “further down the Strip”, now it soon turns out that that’s like saying running a marathon is good training if you want to take up a little light jogging! 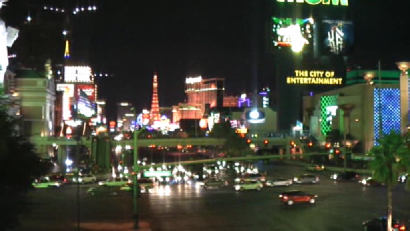 So I wandered down the Strip calling into a few of the casinos on the way. 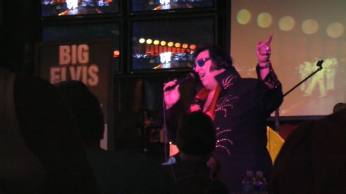 I knew I wanted to see the Big Elvis show at Bills casino, so was quite relieved when I found this place and realised that their drinks are cheaper, and the atmosphere is good, so this became a regular stop on my trips up and down The Strip during my stay there. 3pm and Elvis entered the building, BIG ELVIS that is; this is a gentleman who performs a (Free) show in the lounge in Bills a few days a week. He has a great voice and has been a regular in Vegas for a number of years at different casinos. I know this as during the show a young married couple (her wearing a White Dress, him bow tie and dinner suit, bit of a give away really) came in to watch and went over to say Hi. Apparently the groom had proposed during BIG ELVIS’s show a few years before, and they had gotten married that day and had to stop in. My trip was now planned, Rodney Carrington Friday night, The Jersey Boys on Sunday and Elton John on Saturday night, they were booked in that order to ensure that I got to see the main ones. I also took the opportunity to see the X Burlesque show on the Saturday night as it was in the Flamingo which is opposite Caesers Palace where Elton John was playing. This sort of planning becomes essential when you realise just how Flamin long The Strip really is! So for the remainder of Friday I wandered and did some filming with the video camera I had taken, and then headed to Rodney Carrington’s show in the evening. Rodney Carrington is almost unknown outside the US. Although In the States he has had a TV series (sitcom) that ran for 3 seasons and has sold out many many concert tours. His mixture of jokes and funny songs make for a really enjoyable evening, and audience members permitting, one of his songs “Show them To Me” makes for a visually stimulating evening for gentlemen in the audience… check it out on You Tube! Saturday and I decide to venture even further down The Strip, now to this point my feet had held up really well, but in one day I managed to severely mess them up, so for the remainder of the time there it was a case of “most direct route to everywhere and alternative (to walking) modes of transport wherever possible”. I made it as far as Treasure Island on foot and walked back. This is a great way to see the place, but you soon come to the dawning realisation that, as a few people have mentioned, Las Vegas is the only place where the hotel your walking towards is moving away from you at almost the same speed! Or at least that is what it can seem like! Saturday night and Elton John – The Red Piano Tour, now I must admit, apart from knowing of most of his hits I cannot say I was a massive fan of Mr John. I get to Caesars’ Palace and am greeted, after walking a distance roughly equivalent to 4 football fields from the front door, with an almighty scrum as they try and shove everyone (except the gold card holders of course) through 2 doors with airport style metal detectors. Not sure why they think Mr John is such a high risk as I never saw this level of security anywhere else during my stay. Eventually I get through and head up 3 levels to my seat. I don’t even have time to grab a drink and there is no interval, so I’m not a particularly happy bunny as the lights dim. However the show itself is spectacular with video projections, inflatables and a cast of th… about 20! Plus musicians and the guy himself. I can honestly say I knew all the songs bar maybe 2 and that was my lack of knowledge rather that his fault. The audience lapped it up and the man himself gave it his all. Well worth seeing, but not necessarily at the top of my list to see again. The X Burlesque show is based in the Flamingo hotel and features a troop of about 6 very acrobatic and sartorially challenged ladies. This was an interesting show although I nearly ended up not seeing it. This is what happened, I get to the venue no problem, having bought my ticket that afternoon. A “V.I.P.” seat no less, I think that’s what they called it. Now I mistakenly thought that meant I would be seated first, maybe even a free drinkie but no it meant they put me sitting at the front, facing into the room. Not around a table like EVERYONE ELSE WAS! I stuck this for a while, even after a couple who also had “V.I.P.” tickets had scurried to the back of the room. Then good sense got the better of me; strangely it happened around the time a video screen showed an E! News story on the show which mentioned that members of the audience are pulled to the stage………whoosh……… what was that ………… that was me heading for the back of the room and jamming myself under a table. Where strangely enough I again became almost invisible to the waiting staff at this establishment! The show was good fun, but was slightly spoilt by a group of … how can I put this politely … LOUTS who proceeded to talk and shout and generally prove that certain people don’t know how to behave in a live entertainment situation. Sunday, and my last full day in Vegas, my feet are resembling … well nothing on earth really. So I hobble to the Metro that runs down the back of the hotels on one side of The Strip and head to the end of the line… which is even below Circus Circus, and to the Las Vegas Hilton where I “Boldly go” where many many thousands have gone before me. “The Star Trek Experience”. This was a fun, if somewhat expensive way, to spend a few hours. Only slightly embarrassing moment being when I try to fit the seatbelt for one of the rides, realise it won’t go round me, think no probs I’ll fake it, in the way all larger people know how, jam the end of it under one arm so it looks locked. No problem except in the 24 century they have a bl**dy panel that shows if any seatbelts aren’t locked in place. Crap! “Could you fasten your seatbelt please” everyone turns to look AND it turns out it would go round me after all, I had just pulled it too fast. There you go even in the time of Captains Kirk and Picard you can get caught out. 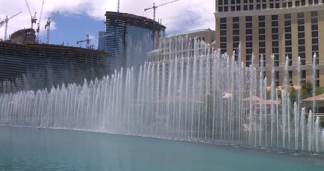 I take the Metro back to centre Strip, and I head for the Bellagio Fountains. Situated in a vast man made lake in front of the Bellagio hotel. Here giant fountains fire water 400ft in the air, to music, a definite must see as far as free shows go in Las Vegas. Sunday night and I take a taxi to the Pallazzo for the Jersey Boys. This is a show I really wanted to see. As a regular in London seeing shows, I was excited when I heard this was making it over from the great White Way (Broadway to the uninitiated). Then I became disappointed when I realised I probably wouldn’t be getting to London in the next few months, so may miss it, as with the way shows are closing over here at the moment none are safe, ask the cast of Lord of the Rings the musical! 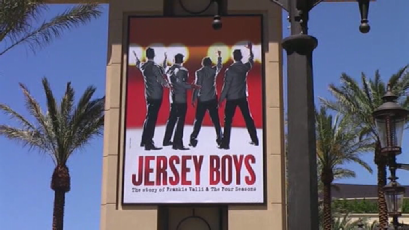 The Jersey Boys, as mentioned previously, tells the story of The Four Seasons a band from New York who had hits throughout the 1960’s and 70’s. Think you haven’t heard of them? “Big Girls Don’t Cry”, “Cherie”, “Walk Like a Man”, “Can’t Take My Eyes Off You”, “Let’s Hang On” need I say more? The show is brilliant, the cast faultless, and one I will definitely be seeing again. Oh and you learn something too, Joe Pesci (American actor of Goodfellas and My Cousin Vinney fame) introduced Bob Guadio the writer of all those great hits to the voice that sang them Frankie Valli. As they grew up in the same neighbourhood of Newark New York, small world isn’t it. 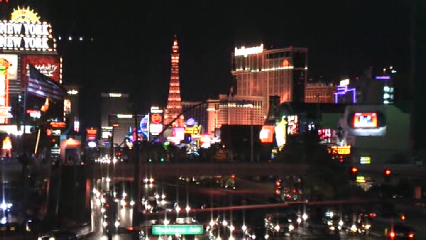 I get a taxi back to my hotel, grab my camera, and get some shots of The Strip by night, a wonderful sight, confirming that Las Vegas really is somewhere I really want to visit again. I mean I still didn’t get into some of the Casinos. I didn’t take the helicopter ride to the Grand Canyon, due to weight issues, the issue? I weigh too much! The size I currently am they wanted to charge me for 2 seats. I kid you not! So there you have it, sleep, get up, go to airport and take a 1hr 20 min flight to Denver, 2 hour stop over, and then a 9 hour flight to the UK, with an entertainment system that doesn’t work and no chance of an exit row seat! Cramped and fed up I arrive back in London. Las Vegas, definitely go back in a moment, probably straight to there as I think I could quite easily fill a week, and a direct flight would make the journey less arduous.